Soprano MM Indiana University Ms Kingston has sung opera roles and solo and duet recitals throughout the northeastern US. 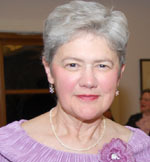 She was on the Voice Faculty of New England Conservatory's Prep and Continuing Ed and the Powers Music Schools for nearly 30 years. She has a private teaching studio in Belmont, MA and offers Vocal Presence for Speakers in both educational and business settings.